Happy Easter to you! Those little violas look so sweet! A very happy Easter to you! I love the bunny peeking from behind the pot! 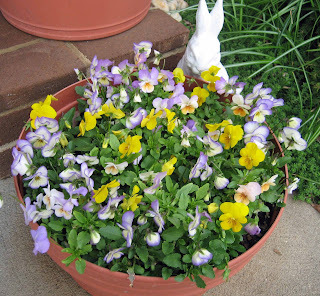 Dear Carol, wish you a very happy Easter!The pansies look beautiful and the bunny is a cutie too. Happy Easter, Carol. I hope you got an egg with money in it. At least your pansies don't mind the cold so much...hope it warms up for all of us soon!